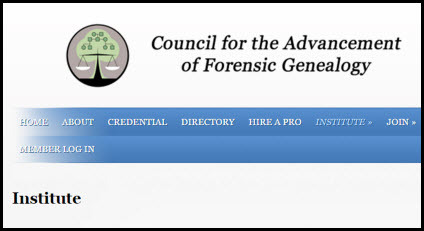 Because so many people have been distracted by SLIG this week, the Council for the Advancement of Forensic Genealogy (CAFG) has extended the deadline to apply for one of two scholarships to attend the 6th Annual Forensic Genealogy Institute (FGI), to be held March 7-9, 2017, at The Menger Hotel at the Riverwalk in San Antonio, Texas. The FGI scholarship is open to all FGI 2017 registrants. Individuals interested in financial assistance to attend the institute should send a request of not more than 400 words to [email protected] explaining how they feel receiving a FGI Scholarship might best help them within field of forensic genealogy. Applications are due Wednesday, February 1st, 2017. The scholarship recipients will receive a partial tuition refund of $225 once they have completed the institute. So… what’s FG! 2017? It’s a hands-on institute offering for forensic genealogists and aspiring, advancing genealogists interested in learning more about this part of the genealogy field. This year there will be two tracks that are being offered for the first time. The first track will be led by Debbie Parker Wayne, CG, CGL, co-author of the first workbook for genetic genealogy and the innovator who brought week-long DNA courses to genealogy institutes in 2014. This three-day workshop, Applying Genetic Genealogy to a Forensic Specialty, is based on Genetic Genealogy in Practice, with additional material customized for forensic genealogists. Genetic genealogy is a complex topic requiring practice and study to master. There is no course prerequisite, but review of the textbook prior to the course is highly recommended. Day one covers the science needed to use genetic genealogy effectively, standards, ethics, tests and tools offered by testing companies, and introduces mitochondrial DNA analysis methods. Day two introduces Y-DNA and autosomal analysis methods. Day three introduces X-DNA analysis methods, usage and pros and cons of more advanced analysis tools, and how to report genetic genealogy findings. Each person attending the course must have a copy of Genetic Genealogy in Practice as the textbook for the course. Additional syllabus material with a forensic focus will be provided in class. The second track, Becoming an Expert: Law and the Forensic Genealogist, will be led by yours truly, The Legal Genealogist, Judy G. Russell, JD, CG, CGL, aka The Legal Genealogist – a brand new course that forensic genealogists won’t want to miss. From the standards that govern genealogical research to the rules that govern courtroom evidence, the law requires expertise of the forensic genealogist. In this three-day, hands-on program, current and aspiring forensic genealogists will learn more about becoming that kind of expert, from applying the Genealogical Proof Standard to finding the applicable law to understanding the legal processes that govern expert witnesses in forensic cases. Day one includes genealogical expertise and the GPS, overview of civil procedure – courtroom, evidence rules, expert witness rules, legal lingo and the assignment of CAFG’s practicum. Day two includes ethics for the genealogist, ethics for the forensic expert, the probate process and land law. Day three includes finding the law, and a hands on application of finding laws and a wrap up of the practicum. The practicum will be led by Juli Whittaker and Helen Daglas. All participants must bring a laptop in order to be able to work the in class exercises. There are only a few seats left in each class, so register now — and apply for those scholarships before Wednesday!! Thank you, Judy. Registration numbers are right on course, and always hit a big rush after SLIG. Seats are limited for both tracks. The hardest decision here is WHICH track to take! Hope everybody who wants the courses manages to register soon — and try for one of the scholarships!